Delegate Kathy Tran (VA-42) and her parents fled Vietnam as boat refugees when she was just seven months old. On the voyage, she grew so sick she almost died at sea. Although many other countries offered them asylum, they waited 13 months for the United States to accept their application. Kathy’s family risked everything to come to America because this country has always represented hope, opportunity and freedom. Now, she’s fighting for the American values that brought her family here in the Virginia House of Delegates representing the people of the 42nd District in the Commonweatlh of Virginia. Kathy graduated from Duke University and earned her Master of Social Work from the University of Michigan. The past president of her local PTA, she and her husband Matt live in West Springfield with their four children, Daven (8), Charlotte (6), Quinn (4), and baby Elise. They are avid Washington Nationals fans. 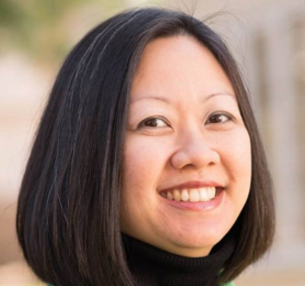 Kathy Tran (born 1978) shares the distinction with Kelly Fowler of being the first Asian-American women to be elected to the U.S. state of Virginia’s House of Delegates in November 2017. 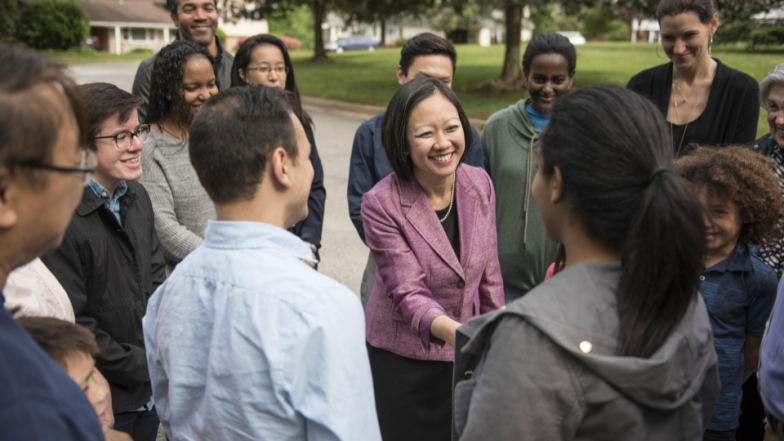 She is the first Vietnamese American elected official on any level in the Commonwealth and is a Duke University graduate with a Masters in Social Work degree from the University of Michigan. TRAN, KATHY K L has run in 1 race for public office, winning 1 of them. The candidate has raised a total of$662,147. Kathy and her family fled Vietnam as refugees when she was just seven months old. They risked everything to come to the United States because for them, this country represented hope, opportunity, and freedom. Hate is a problem, not a policy, and Kathy uses her voice as Delegate to stand against those who seek to undermine a welcoming and inclusive Virginia. At a time when the most fundamental elements of a well-functioning democracy are being challenged across the country, Kathy fights against laws and practices that keep Virginians from exercising their right to vote or seek to weaken our vote through gerrymandering or the influence of big money in politics. As a mom of four and the president of her local PTA, Kathy knows we need to ensure all children in Virginia have access to high-quality public education so they can thrive and compete. As Delegate, she fights to invest in our public school system to lower class sizes and increase teacher pay. Kathy fights for affordable higher education, investment in our community colleges, and works to build strong career pathways from schools to the workforce. A former board member of the Esther Peterson Child Development Center at the U.S. Department of Labor, Kathy understands the critical importance of early childhood education in determining future academic success and will be a strong advocate in the General Assembly for universal pre-K. The 42nd House District is home to Mason Neck State Park, one of our region’s greatest natural treasures. We must take action to not only protect Virginia’s natural heritage, but protect the future of our planet. Climate change is an existential threat, and requires urgent action. If our president refuses to address it, it is up to states to lead the way. We need to focus on growing our clean energy industries in Virginia. We can be a global leader and innovator on solar, wind, and other renewable sources of energy, but it requires leadership at the state level. At the U.S. Department of Labor, Kathy helped jumpstart the bio-energy industry in Montana. She helped bring together growers, economic development agencies, workforce development leaders, tribal governments, educational institutions, and other partners to put communities on a pathway to prosperity while producing renewable fuel sources. Kathy takes this experience and expertise to Richmond, and never stops fighting for Virginia’s clean energy future. Kathy is proud to have been endorsed by the Virginia League of Conservation Voters (VALCV) and the Sierra Club during the 2017 Election. Kathy will always work to protect and expand Virginians’ access to quality, affordable health care. Expanding Medicaid in the commonwealth would ensure that 400,000 vulnerable Virginians will no longer have to decide between paying for health care over other essentials, or waiting for a chronic condition to reach an emergency situation before seeking treatment. Medicaid expansion also grows the economy, fueling the creation of new jobs in health care and social assistance. In fact, states with Medicaid expansion have experienced higher job growth in the health care sector than states that have not expanded their Medicaid programs. Further, every year billions of dollars in our federal taxes leave Virginia to support expanded Medicaid programs in other states; it is time for Virginians to also benefit. Kathy will oppose any attempt by politicians to interfere in a woman’s right to make decisions about her own body, and will fight against any proposed legislation that would impose medically unnecessary restrictions on reproductive health care providers or limit the ability of a woman to make the best decision for her health with her doctor. When Kathy was a baby, her family was welcomed here as refugees. She understands that those who seek the promise of opportunity, hope, and freedom in America help make that promise stronger. Many of the issues facing immigrants and refugees today are issues Kathy faced growing up in the Vietnamese diaspora. That experience has informed her entire career. She has worked with immigrant communities across the country, from teaching ESL classes to detained asylum seekers in Newark, to encouraging entrepreneurship in Detroit’s Latino community, to running after-school programs for immigrant children in San Jose. In her most recent role at the National Immigration Forum, she advocated for policies that would help immigrants reach their full career potential. Kathy supports comprehensive immigration reform that includes a pathway to citizenship and values family-based immigration while meeting our nation’s economic needs. In Virginia, she also works to expand citizenship preparation classes, opposes efforts to shift federal immigration enforcement responsibilities to state and local authorities, and continues to defend Virginia’s in-state tuition for DACA recipients. Kathy has spent her entire career working for all Americans to have the skills, training, and credentials to reach their full career potential. During her 12 years of service at the U.S. Department of Labor, she helped shape national workforce development policy and programs. Now, Kathy brings that expertise to the House of Delegates to ensure that Virginia is globally competitive and that our region attracts good jobs. She will always fight for workforce and education programs that build strong talent pipelines, and for worker’s rights as critical to economic growth and social mobility. One of Kathy’s proudest accomplishments during her time at the U.S. Department of Labor was her work on the Veterans Opportunity to Work (VOW) Act, bipartisan legislation that helped expand employment services for transitioning service members and veterans. As Delegate, Kathy takes leadership in building partnerships with professional licensing boards, employers, industry associations, community colleges and others to make sure veterans are able to translate their intensive, world-class training and work experience to the civilian workforce. She will work to ensure that Virginia fulfills its obligation to our servicemembers and their families, and that our veterans have the tools and opportunities they need to succeed. For Kathy, enacting common-sense gun violence prevention measures means protecting our children and our communities. Parents should not have to worry if their kids will be safe when they send them to school or when they go outside to play. As Delegate, Kathy fights to keep guns out of the hands of criminals, domestic abusers, and those with severe mental illness. She pushes for universal background checks to close the loopholes for sales of firearms at gun shows and over the Internet, and fights to restore Virginia’s “One-Handgun-a-Month” rule to combat gun-running. Kathy also fights for an assault weapons ban and limits on high-capacity magazines. If you have any questions for Kathy Tran, send them to Salina Temesghen at salina.temesghen@gmail.com. Salina will first see if Kathy Tran has answered your question somewhere else. If they haven't, Salina will pass on your question to Kathy Tran and post their answer, if they have one. If you have any suggestions for Kathy Tran, especially if you are a current or former constituent, send them to Salina Temesghen at salina.temesghen@gmail.com. Salina will record your suggestions here. If you have something positive to say about Kathy Tran and you are a Virginia onAir Hub member, send your recommendations to Salina Temesghen at salina.temesghen@gmail.com. My name is Salina Temesghen. I am the lead curator for this Kathy Tran post.